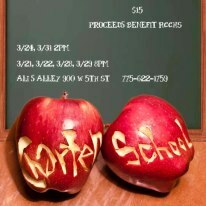 It's a play, It's a Fundraiser-- Wait, It's both!! Charter School, the original play featuring student and teacher monologues about their experiences with charter schools (Rainshadow in particular), was performed with great success. It received great reviews, and generated approximately $1500 due to the generous donations from the community for the silent auction. Thank you to all who came out for the event, and thank you to all who generously donated! Finally, thank you to the students, faculty and staff who wrote, directed, and produced the show.